To some, foot tattoos are the ultimate way to express themselves, while to others, they're nothing but pain and misery. Why the difference in opinion? Before you get your feet tattooed, learn what designs work well on the feet and find out about potential problems you should consider. 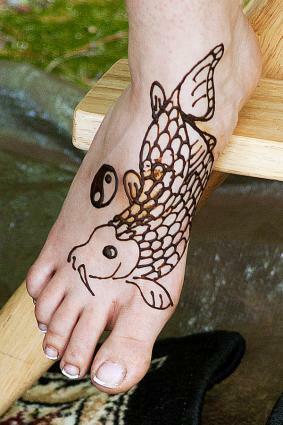 Foot tattoos can be as varied as their owners, and just as beautiful. Popular choices include flowers, scrolls and tribal designs. It isn't uncommon to find a foot tattoo that begins on the side or bottom of the foot and continues to the top. Choose a design that flows with the contours of your feet and won't be pulled out of place by flexing, tendons or toes. Several different tattoos designs work particularly well on the feet. Consider a flower tattoo; it can be a symbol of the Buddhist faith when done on the feet, or just a way to add some beautiful ornamentation to what some consider a less desirable part of the body. Flowers have the benefit of being highly adaptable to any area of the body; if you do not particularly like your feet, pretty them up with beautiful flower tattoos. Small animals make a cute tattoo anywhere, though there does seem to be an added degree of cuteness when they are perched upon the foot. Consider images like frogs, lizards or other animals which "crouch" on top of the foot, looking like they just stopped by for a moment. Stars are the ideal tattoo for your feet. They can be small, and don't have a lot of detail, so they work perfectly with the thin skin of the feet. You can place a single star anywhere on the foot, or try a cluster of shooting stars moving from the ankle to the toes. Butterflies are another small, delicate looking tattoo that perches well on the feet. The details of a butterfly can slide easily over the tendons at the top of the foot, and may even help to hid imperfections if the foot was to jump or twitch during the design. When you contemplate a foot tattoo, don't forget about the toes. Many different foot tattoos could be extended to wrap around the toe as well. Think of flowering vines that wrap around the toes, or just a simple toe ring that ornaments, but doesn't draw attention to, the foot. Hearts are another simple tattoo that can work well on the feet. They can be done in outline or solid-color and can even include details like banners or wings. A heart tat is ideally placed right at the top of the foot, with the point facing down toward the toes. The foot is a long, fairly flat plane that can handle text easily. A word tat can stretch from the toes to the ankle with or without other designs to accent it. Remember to angle the word or letters depending on which foot and which side of the foot you are tattooing. For example, a tattoo on the inside of the right foot should move from toes to ankle, but on the outside of the right foot, it should move from ankle to toes. You have two feet, so why not get two tattoos? You can stretch a tattoo across both feet, breaking it into sections that piece back together when you stand with your feet together, or just get two small tattoos that match. This may be words, symbols or images that work well in pairs, like two flowers or two Zodiac symbols. Choosing your design is just the first step in getting a foot tattoo. The feet have a different set of guidelines than other areas of the body do; make sure you can follow them before you get inked. Depending on the size and placement of the tattoo, healing can range from two to five days. Some tattoo artists recommend not wearing shoes and socks for several days afterwards, while others don't think it's a problem. Regardless, your foot will be sore and uncomfortable while it is healing. If you can't afford to be off your feet for a few days, this may not be a good option for you. Some artists refuse to do foot tattoos. This is because of the problems associated with foot tats, as well as the fact that artists don't want to do bad work. Many tattoos artists will charge a premium to do work on the foot, and many don't guarantee the work or offer free touch-ups. Check out some studios you like, and inquire about tattoos on the feet. Every studio will have its own set of guidelines, so choose one you feel most comfortable with. Foot tattoos tend to spread more than other tattoos. This means that foot tattoo designs tend to blur and fade more quickly than tats placed in other locations. Show the artist your design ideas and ask for feedback. He or she may have some thoughts on ways to tweak design to help cut down on spreading. Keeping your foot in a stationary position for an extended period of time is difficult, so you may find the experience of getting inked to be more unpleasant than with other types of tats. On top of that, there are certain spots on the foot that will cause you to jump involuntarily, like your knee does when a doctor hits it with a reflex hammer. Some tattoo artists will be able to work with the jump, or cover up any lines that get squiggly because of it. However, if you jump unexpectedly, the damage will be done and it may not be able to be fixed. If you have diabetes, getting a tattoo anywhere below the knee is considered a bad idea because of circulation problems. You may be able to find an artist who is willing to do it, but talk to your doctor before you go ahead and get it done. Even if you're healthy, new foot tattoos are more prone to infections than tats in other locations. That's because the tat is placed on an area that gets dirty frequently. Keeping your foot clean and sterile isn't easy, and the healing tattoo needs to be both. The one thing that most artists and tattoo recipients agree on is that the pain level is higher with foot tats than other areas. Whether it is because of the number of nerve endings or the lack of muscle between the skin and the bone, no one seems sure. Foot tattoos also tend to bleed more than tattoos on other parts of the body. Because it can be shown off or covered at will, the foot can an ideal place to get a tattoo. However, you should not make your decision without being aware of the possible drawbacks and risk associated with this placement.